Garden plots are FULL and applications are no longer being accepted. Contact Sue Conner 651-271-9844 with any questions. Get updates from the SAP Community Garden on Facebook. 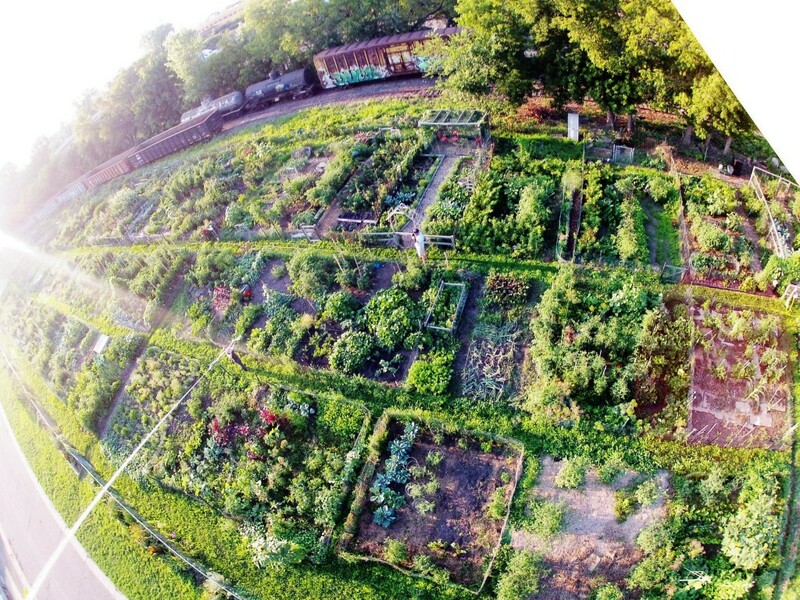 The St. Anthony Park Community garden began in 1981 and has operated continuously since then. It was started by volunteers as a project of the Community Council. Located on an edge of the neighborhood that borders the railroad tracks, it provides an attractive screen between the railroad activity and the neighborhood. Gardeners plant flowers along the fence to bring more color and beauty to the area. It benefits the gardeners who rent plots, the neighborhood, the myriad of folks who walk or drive by at all hours of the day, both residents and those who work nearby. Each year the garden donates hundreds of pounds of produce to food shelters and local low-income residents as a commitment to food justice and sustainability in our community. Bordered by the railroad, highway 280, and the University busway, located near many industrial enterprises and within a few blocks of the light rail, the St. Anthony Park Community Garden is a true oasis in the midst of an intensely urban area. St. Anthony Park is grateful to those early volunteers who began this project with a compost site and a few plots back in 1981. Among them were Joe Keleher, Bob Bacon and Council Director, Ann Copeland. Without them and all the volunteers who followed and who continue to keep it going, this marvelous asset to our neighborhood would not exist. View 2019 Garden Policies here. How do I get a garden plot? How many plots are available? The number of plots available depends on the year because gardeners from past years get to renew their plots if they want to continue for another year. How much does it cost to rent a garden plot? Gardeners pay $30 per year to rent their plot, although donations help support the Community Garden. You can ask other questions here. Learn more about our community garden from MN2020 here. The SAP Community Garden is located on the north side of Robbins Street, between Raymond Avenue and Highway 280. Garden plots are approximately 15X20 feet and are $30.00 each per year. Only one application per household should be filed. There will be a lottery drawn to determine who will be able to rent the available plots. Individuals can rent garden plots annually. The rental fee is $30 for the season. There are 95 plots, which are approximately 15 by 20 feet. Water is available at the garden. About two-thirds of the plots are seasonal plots that are tilled in the spring. The remaining plots are perennial plots that are not tilled. Gardeners who rented a plot the previous year have an opportunity to rent the same plot again. Plots that are not rented by the middle of February are available to new gardeners. A lottery is used to determine which new gardener applicants receive a plot. All gardeners attend a spring meeting where they receive their plot assignment, meet their section manager, and sign-up for volunteer tasks. The garden property is owned by the St. Anthony Park Community Council and is managed totally by volunteers as a project of the Community Council. All gardeners are expected to help with operating the community garden. The steering committee, selected at the spring meeting, provides oversight, organization, communication and guidance throughout the year. For requesting a plot an application is made on this website as well as at Hampden Park Food Co-op. Completed applications are mailed in with the rental fee. If we are not able to provide a plot for you through the lottery, your rental fee will be returned. If you are to receive a plot, you will be notified by a postcard as well as an email. You are expected to attend the spring meeting to get your plot assignment. Contact Sue Conner (sue.conner@comcast.net) or 651-271-9844 if you have further questions.